On Nov. 29 Tropical Cyclone Dahlia became the first tropical cyclone of the 2017-2018 Southwest Indian Ocean season. The Global Precipitation Measurement Mission or GPM core satellite provided forecasters with a look inside the clouds and into the rate rain was falling. Heavy rainfall has created the potential for landslides and NASA analyzed areas that may be subject. 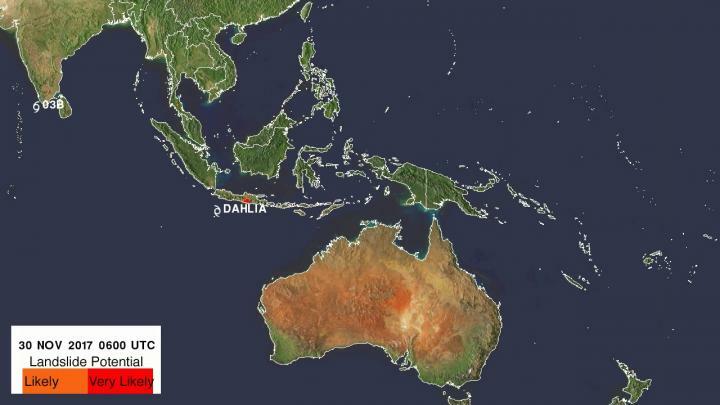 The next day, Dahlia was moving toward the southeast and was passing to the south of the Indonesian islands of Java and Sumatra with wind speeds of about 35 kts (40.3 mph). Tropical cyclone Dahlia was passing over the warm ocean waters (28 to 29 degrees Celsius) of the Indian Ocean. On November 29, 2017 at 12:31 p.m. EST (1731 UTC) NASA's GPM Core Observatory satellite passed above forming tropical cyclone Dahlia. Data collected by GPM's Microwave Imager (GMI) and Dual-Frequency Precipitation Radar (DPR) instruments revealed the locations of heavy rainfall around the tropical cyclone. GPM is a joint mission between NASA and the Japanese space agency JAXA. GPM's GMI found that rain was falling at rates greater than 76 mm (~3 inches) per hour in powerful storms around Dahlia's center of circulation. GPM's radar (DPR Ku Band) measured precipitation in a swath that passed to the west of the heavy rainfall occurring near the center of the tropical cyclone. GPM's radar scanned bands northwest of the Dahlia's center where rain was dropping at a rate of 60 mm (2.4 inches) per hour. GPM's radar (DPR Ku Band) provided data used to create a 3-D topographic view of precipitation near the forming tropical cyclone. These probes by DPR showed that storm tops west of the Dahlia's center were stretching to heights of almost 12 km (7.4 miles). At NASA's Goddard Space Flight Center in Greenbelt, Md. a landslide potential map was created based on rainfall estimates from near real-time Multi-satellite Precipitation Analysis (TMPA) data. The map shows that heavy rainfall during the past week resulted in an area of potential landslides on the slopes of southern Java. On Dec. 1 at 10 a.m. EST (1500 UTC) Tropical Cyclone Dahlia had maximum sustained winds near 50 knots (57 mph/92 kph). Dalia was located near 10.7 degrees south latitude and 110.6 degrees east longitude. That's about 738 nautical miles north-northwest of Learmonth, Australia. Dahlia has tracked east-southeastward at 9 knots 10.3 mph/16.6 kph). The Joint Typhoon Warning Center (JTWC) predicts that tropical cyclone Dahlia will initially intensify to tropical storm force as it moves over the Indian Ocean toward the northwestern Australia. Dahlia is then expected to encounter cooler waters and weaken to a tropical depression before approaching the northwestern Australia coast on about December 5, 2017.